New Times, Great Things, Etc. 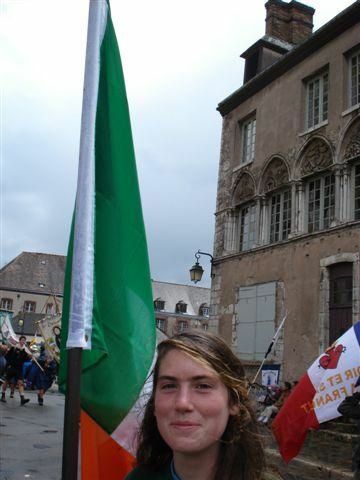 The Official Chartres Pictures. Beautiful. A Core Repertoire of Music? Do Catholics Know Veni Creator? What is a Sequence? Where did it come from? The Mundelein Psalter: it's here! Does your parish have a dress code? A dear friend of mine sent this wonderful sermon to me tonight, delivered by Fr. Richard Cipolla this past weekend on Pentecost Sunday. This was at a Traditional Mass organized by the St. Gregory Society. Here's the link to the sermon on their website. This feast is for all practical purposes the only chance to preach on the Holy Spirit per se. Perhaps the proper thing to do, after hearing the famous and familiar and dramatic reading from the Acts of the Apostles about the pouring forth of the Spirit onto Mary and the apostles, and therefore onto the Church, one should sit down and maintain a respectful and contemplative silence in the face of such an awesome event. For Pentecost is the last in a series of the mighty acts of God: creation hovered over by the Spirit, the creation of man breathed into life by the breath of God, the incarnation of God by the power of the Spirit in the body and soul of the Blessed Virgin Mary, the resurrection of Jesus by the Spirit of life, and today, the outpouring of the very life and substance and power of God onto the Church, making the sacramental life of the Church possible, making salvation itself a reality, making the presence of the immortal, unfathomable God real in this world. The coming of the Holy Spirit is an end to pie in the sky religion. God has tented among his people and blows where he will and dwells in power wherever there is the Catholic Church. One of the highlights of the liturgical movement of the late nineteenth and first half of the twentieth century was the publication of a small book by Romano Guardini called The Spirit of the Liturgy. It is not a book of scholarship nor a history of the liturgy. It deals with the fundamental understanding of the liturgy in terms that have never been surpassed. 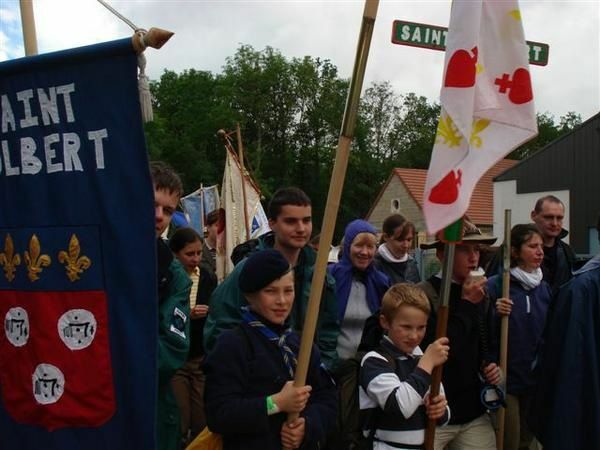 Its importance was noted by the then Cardinal Ratzinger when he published in 1999 his collection of essays on the liturgy and named the book The Spirit of the Liturgy. In the introduction Cardinal Ratzinger marks the importance of Guardini's book and honors Guardini with choosing the same title: The Spirit of the Liturgy. It is interesting that in neither book is there a specific chapter or section dedicated to the role of the Holy Spirit in the liturgy. But this is so because both men understood that Christian worship is nothing other than worship in spirit and truth, that the Christian cannot worship God except in the Holy Spirit, who is the Spirit of truth. Now this phrase: worship in spirit, or more specifically, worship in the Holy Spirit, has been associated in recent times, but there are also similar movements in the past, with a specific type of experience that involves such phenomena as speaking in tongues, great emotional experiences, in which the individual is caught up into an ecstatic state. These signs are then offered as proof that whatever is going on is the work of the Holy Spirit and is therefore worship in spirit and truth. However we judge this phenomenon, one can say that it has nothing to do with worship of God as the Catholic understands it in the liturgy. For the role of the Holy Spirit in the liturgy is not at all to seize individuals with special fervor; it is not to stir up emotions; it is not to instruct or teach at least in the didactic sense. The Spirit provides the unifying presence of God without which worship degenerates into idolatry, either the worship of the community or the worship of the self. It is only that Spirit bestowed in baptism and confirmation that can forge that unity between people that enables them to offer the sacrifice of praise and thanksgiving that is the essence of worship. This unity can never be achieved by anything we do. It certainly is not the product of speaking the same language. It is certainly is not the product of common tastes, style, upbringing, nationality etc. If this were the basis for this unity we could hardly call ourselves Catholics. The Church at prayer is bound by the Holy Spirit into that body that is the body of Christ, and it is this Spirit that makes possible the overcoming of that individualism that makes worship impossible. That is, the Spirit makes it possible for me as an individual to enter into that place that is the body of Christ, in which I give myself over to this sacrifice of praise and thanksgiving. Catholic worship demands the sacrifice of the individual, demands the giving over of my likes and dislikes, my mood, my wants and needs; worship demands that I renounce whatever excludes the others in the community at the liturgy, that I give myself over to the other, to the others, as we all do the same thing, participate with our mind, body and soul in the sacrifice of the Mass in the power of the Holy Spirit. How difficult this is for contemporary Western, affluent man, who assumes that all things are for his own personal benefit. How difficult this is for Catholics brought up to believe that the liturgy must be tailored to their wants and needs and taste and sensibilities. How difficult it is for Catholics who have never heard that humility is the prerequisite of active participation in the Mass, humility by renunciation, humility by the abdication of self-rule and self-sufficiency. 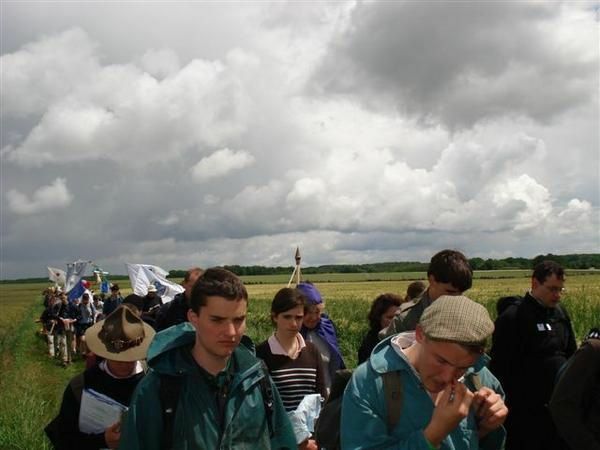 And humility, in the words of Romano Guardini, by positive action: "by the acceptance of the spiritual principles which the liturgy offers and which far transcend the little world of individual spiritual existence." David Brooks, the author of the now classic Bobos in Paradise which described so well a whole generation of affluent Americans unmoored from tradition and yet longing for something else, had an editorial in the New York Times on Friday about the rise of quasi-Catholics in this country and their contribution to the economic boom: the title is "Bad for Church, good for country. What is a quasi-Catholic? He is someone who remains a Catholic in the sense that he attends Mass often, not always, but often, appreciates family values, is not afraid of hard work, but in the end lives his life as he sees fit, that is, with a healthy American skepticism towards dogma and the official teaching of the Church. He is someone who has followed the quasi-Protestant into a world of lite religion, a world in which religious faith exists in some sort of twilight zone where American enterprise and pride and financial success becomes undistinguishable from religion, a world in which worship as sacrifice is unintelligible. That this has happened comes as no surprise to many of us who understand the ancient dictum: lex orandi, lex credendi, how people worship determines what people believe. The collapse of liturgy in Protestantism almost at its very inception, the denial of liturgical worship and sacraments, the reduction of worship to didactism or pietism, the emphasis on emotion and feeling: all guaranteed the triumph of quasi-Protestantism as the steamroller of secularism flattened most Christian traces of Luther, Calvin and Wesley into a vague ethical program with no foundation in Scripture and Tradition and with no weapons to fight against relativism and individualism. So too is the situation of quasi-Catholics, and their existence is known to all of us here, their existence is known to priests and bishops even if they wish to deny it. We see them in countless photographs, smiling, as they attend posh dinners for worthy causes, as they smile as they hand over large checks to church leaders for Catholic charities, smiling as their children receive confirmation, smiling not only with pride for their children, but also smiling as they ponder what all of this really means in the end and what it has to do with their lives. The appearance of quasi-Catholics was inevitable in this country as Catholics assimilated to the Protestant way of looking at life and faith as something merely personal. But the past forty years have indeed seen the real rise of this phenomenon, and this has come about because of the fertilizing action of a quasi-liturgy that has set us adrift from the Tradition in which liturgical worship alone can exist: the Tradition whose roots are in the blood of the Cross, whose roots are in the sacrifice of the Cross, whose roots are fed by the Truth himself, our Lord Jesus Christ, and whose power and presence in the world is made manifest by the working of the Holy Spirit. Alexander Schmemann, the Russian Orthodox theologian, said that at the very time that the world was growing tired of modernism the Catholic Church in the 1960's decided to embrace it. Indeed, when one looks back, it is remarkable that at that very time in American Catholic history in which Catholics began to really enjoy the fruit of American capitalism, when they began to become educated, when they were let in to the best clubs, that they were given a liturgy that was fabricated, and that is the Pope's word, not mine, fabricated especially for them, in which creativity and novelty were encouraged, personal liturgies for different groups, in which the priest faced the people as if he were talking to them instead of God, in which active participation became synonymous with getting as many laypeople in the sanctuary to do something that everyone could see like at a high school assembly, a liturgy fabricated for the people of a specific time, whose purpose was to make things clear and people happy. Quasi-liturgy for quasi-Catholics. That is the situation. Now there are those Catholics, and you may know some of them, who are not satisfied with the present situation and believe that what is at stake here is the Catholic faith itself. There are those who believe that if we continue down this path we will all be sucked up by the quasi-religion of most Americans, which has little to do with what happened at Pentecost. If this is true, what is to be done? Is it possible to go back to the real thing once you have become addicted to aspartame? Is it possible to return to worship that has at its very heart sacrifice, both in the objective sense as the sacrifice of Christ re-presented, and in the subjective sense as the self-sacrifice of the worshipper to enter into the holy of holies with the community formed by the Holy Spirit? That is the question to ask on this Pentecost. And that is what to pray about on this Pentecost in our prayer to the Holy Spirit. O Holy Spirit, who brooded over creation, who gave breath and life to man, whose power shot through the life, death and resurrection of Christ, whose presence in the Church is real and constant, give us the courage and the humility and the willingness to sacrifice ourselves to bring about the renewal of the liturgy of your Church. Deliver us from cynicism and from despondency. Fill us with hope and let us see that with God all things are possible. Amen. (St. Louis, May 2007) - On Friday, June 15th, starting at 1:00 pm, the Cathedral Basilica of St. Louis will be the site of a church event not seen in St. Louis in decades -- ordinations to the priesthood in the Traditional Latin Rite. The Most Reverend Archbishop Raymond L. Burke will be presiding at this ceremony, in which two deacons of the Institute of Christ the King Sovereign Priest will be ordained Roman Catholic priests. The Institute of Christ the King is a society of priests dedicated to Catholic tradition, founded in Italy in 1990. 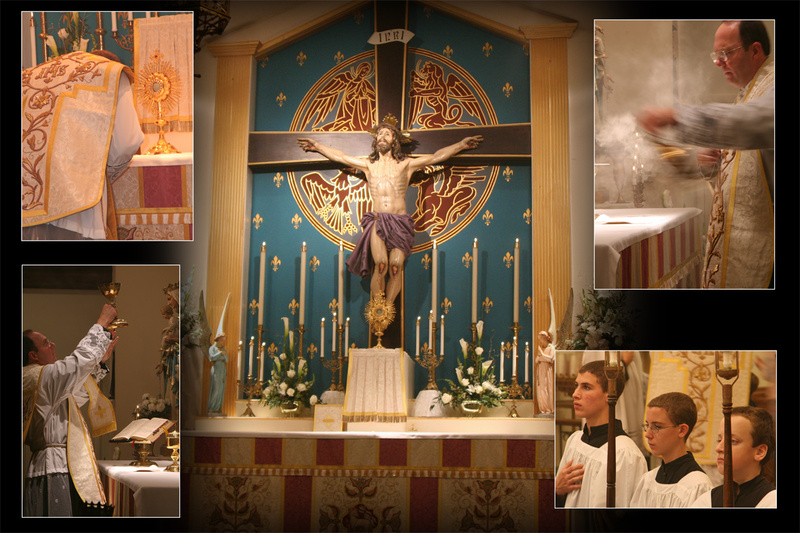 Priests of the Institute were assigned the historic St. Francis de Sales Oratory in July 2005 by Archbishop Burke. Once known as the Cathedral of South St. Louis for its size and magnificence, this church is now home of the Latin Mass Community of St. Louis. A vibrant community has grown at St. Francis de Sales since the Institute arrived almost two years ago, attendance increasing from 300 to nearly 800 each Sunday. Here the Classical Latin Mass is offered every day, and twice on Sundays, along with several traditional Catholic devotions throughout the week. The “Latin Mass” has been the focus of much media attention in the past months, since rumors surfaced that Pope Benedict XVI plans to issue a document granting a wider use of the Classical or “Traditional” Latin Rite. This millennial liturgy was substituted in 1969 by the “New Order of Mass,” now celebrated in most Catholic churches. However, Pope Benedict and other high ranking officials of the Catholic Church see an important role for the Classical Latin Rite, and recognize the ever waxing interest and desire for the traditional Mass in Latin. 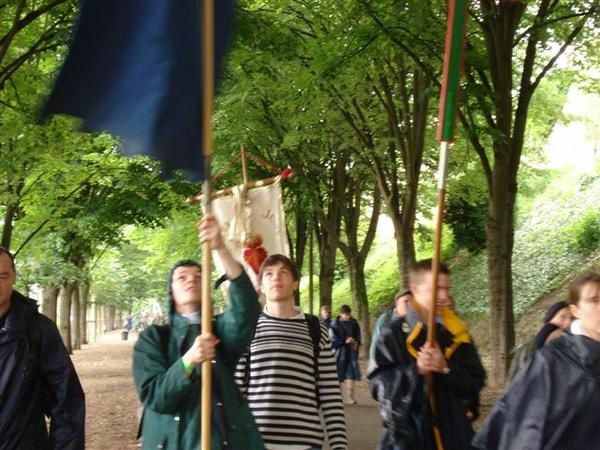 Unlike what many would think, the Traditional Latin Rite is not a subject of nostalgia. Anyone attending one of the now hundreds of churches in the United States where the Latin Mass is celebrated, will immediately note the youthfulness of the congregation, and the vibrancy of the community. Young adults and young large families with many children skew the average age to the mid 40s if not lower. The reverence, beauty, timelessness and transcendence of the venerable Rite are often cited as the points of attraction. And it is the general experience of the clergy who celebrate the Traditional Latin Mass that their congregations are growing very steadily. All the churches staffed by the Institute of Christ the King demonstrate this phenomenon, St. Francis de Sales Oratory in St. Louis being a particularly striking example, were the congregation has nearly tripled in size in two years. The Institute of Christ the King Sovereign Priest itself is evidence of this growth factor. 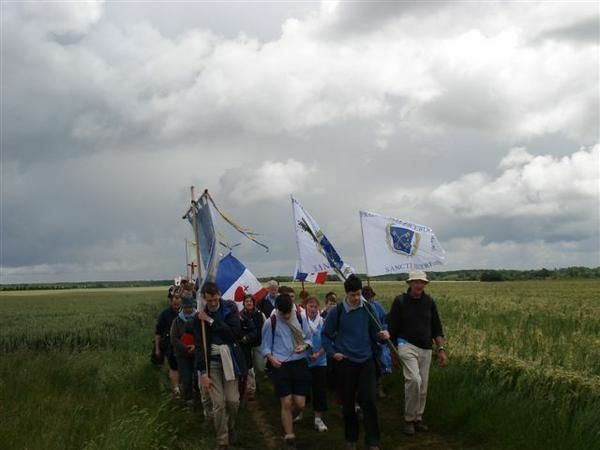 It was founded in 1990 by two French priests, Msgr. Gilles Wach and Fr. Philippe Mora, who sought to establish a seminary that would train young men for the priesthood desiring to be formed and educated in the tradition of the Catholic Church -- theological as well as liturgical. While at first established as a mission seminary in Gabon, Africa, in a matter of months the Institute was invited by the Archbishop of Florence, Italy, to relocate to the village of Gricigliano in his archdiocese. Two heiresses had left property to the Archdiocese of Florence to be used by any Catholic order or community dedicated to the Traditional Latin Mass. It was to in this property, the Villa Martelli in Gricigliano, that the Institute established its motherhouse and seminary. 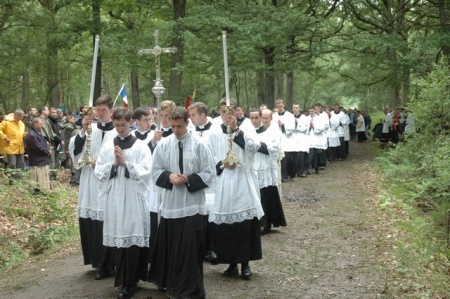 After only sixteen years the Institute of Christ the King now has more than 50 priests stationed in over 40 locations in Europe, Africa, and the United States, where all the sacraments of the church are offered in the Traditional Latin Rite. In the United States the Institute is present in Chicago, Rockford, St. Louis, Kansas City, Green Bay, Wausau, Oakland, and Santa Clara. It receives several inquiries on a weekly basis from young men who wish to become priests in the Institute. 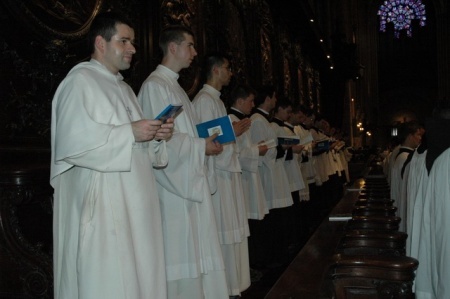 As its seminary formation program is nearly filled to capacity with 70 men at the different stages of preparation for the priesthood, the superiors of the Institute of Christ the King have the rare problem of having too many aspirants to their seminary. The ceremony on June 15th, at the Cathedral Basilica of St. Louis will mark the first time that priests of the Institute of Christ the King are ordained in the United States. Usually, the ordinations take place at their seminary in Florence. Members of the Institute will be providing the Gregorian Chant and filling the several liturgical roles of the intricate and strikingly beautiful Ordination ceremony and Pontifical Solemn High Mass, which will be presided by the Most Reverend Raymond L. Burke, Archbishop of St. Louis. For more information call 314-771-3100. It was less than a year ago when Richard Rice first started posting his newly typeset versions of the official Gregorian communion antiphons together with the full Psalm verses in musical notation. He began the project in response to a crying need for music that would allow these communion antiphons to be sung the way they are intended to be sung. It was a special gift to our schola because we had tremendous struggles in finding these. They are not even listed in the Gregorian Missal, and though they are given in the Graduale, they are not printed out, so you had to go to the Vulgate to find them, and that still left the problem of actually pointing them correctly, which is no easy task for new singers. So Richard's editions filled a gap in the existing liturgical books. Since he began posting the full sheet music, we've used them every week in our parish. Many others have too. Indeed, I've heard from parishes in France, Germany, Brazil, China, and all over North America who have benefited from his work. It allows scholas to sing the antiphon precisely according to rubrics in place since the 8th century (or earlier). It is also a great place for beginning scholas to start using the propers of the Mass. 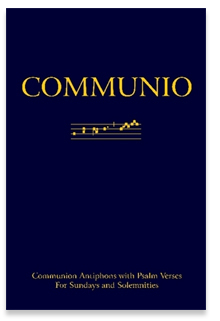 In any case, the CMAA has announced that the full communion antiphons with Psalms are now available in print, in a 315-page book, beautifully bound and easy to use: Communio: Communion Antiphons with Psalm Verses, as prepared by Richard Rice and with an instructional forward by him. You can purchase it for $19.50, and it will be delivered in 7-10 days. This wonderfully useful book covers the Sundays and Solemnities of the Church Year for both the current Roman Missal, using the modern calendar with its three year cycle, and the 1962 Roman Missal, following the traditional calendar. These 110 chants are pristine, verbatim recreations of those in the Solesmes editions, and cover Masses that are most likely to be sung during the year, including major feasts (under both old and new liturgical disciplines), and the more important seasonal and ritual Masses (Ash Wednesday, Nuptial Mass, etc.). You referred to the "drastic reordering of the calendar" and I think that the harm caused by those mostly unneccessary disruptions is not fully appreciated. First is the loss of much of the seasonal and cyclical "rhythm" that gives a Catholic part of his identity and helps define his relationship with the world. Shorn of Septuagesima we are thrust abruptly into Lent; major feasts appear suddenly without vigils and depart as quickly without octaves. Once-holy days are now just line-items in the bulletin under the week's Mass intentions, while others are postponed until a less inconvenient time -- one will presumably be at church the following Sunday anyway! Seven-and-a-half times through the traditional calendar have also given me and my family a tremendous appreciation for the stability of a single cycle of the traditional lectionary. Hearing those scriptural and Gospel readings -- which the Church judged for many hundreds of years as most suitable -- once every three years just doesn't cut it for me. ... There are many worthy additions that could be made onto the 1962 foundation: O.T. readings which either foreshadow the Epistle/Gospel or directly complement them would be welcome when they fit "organically," but the remainder can safely be eschewed, at least at Mass. The extra reading would thereby become the exception rather than the norm, which should serve to emphasize its message. In the cases where there is a true value in the new readings for a particular feast or solemnity, they could be included for use ad libitum. To my mind the chief value of the new lectionary is the weekday readings, certainly the Fathers of [Vatican II] had in mind the many ferias in which the previous Sunday's Mass was simply repeated when they called for a revision of the calendar. Since Catholics who attend daily Mass tend to be better educated in the Faith, perhaps the three-year cycle and the leftover O.T. readings can be utilized for these ferias. Septuagesima and the Ember Days must be restored, and the awkwardly named "Ordinary Time" ... should be re-replaced with the ordinal Sundays after Epiphany and Pentecost. Finally, the versions of the readings must revert to the 1962 editions, hard teachings and all. It's all been said before, of course, but not quite like this. Thank you, Allen! One of our readers, an artist practicing in various domains of the sacred arts, sent me a link to his website, Davis d'Ambly. From the look of what he produces, he is either Anglican or produces mainly for Anglicans, however, this would evidently be easily adapted to a Catholic context of course. Just a quick note that this two-day conference on chant in Stamford, Connecticut, now has more than 100 registrants! I just get giddy over this kind of news. Can you imagine? It's just wonderful. Further to what I was discussing yesterday in the post about demand for training in the classical Roman liturgy, I have two updates; one more on that theme, and the other, another training possibility for clergy. "...during this period of waiting [for a possible papal Motu Proprio], the interest and anticipation seem to have taken on a life of their own. Orders pour in the for the DVD version of our educational/training film The Most Beautiful Thing This Side of Heaven, orders from laity and priests. This month we printed 20,000 more copies of the Latin-English Booklet Missal, and are filling orders from across the US and abroad. First off, I should note what Fr. Augustine Thompson has noted in the comments. For a priest who is not yet comfortable with ecclesiastical Latin but would like to come to be, one source in particular is both affordable and targets the Missal and the Breviary; Scanlon and Scanlon's Latin Grammar: Grammar Vocabularies and Exercises in Preparation for the Reading of the Missal and Breviary which retails for only $18 USD. The St. Gregory Society of New Haven, Connecticut, has had to classical Roman liturgy tutorials in recent years, the last one completed just before Lent. They offer either individual or group instructions, depending on demand. The Rev. Kevin Fitzpatrick, executive board member of SGS, offers his services as do Bill Riccio, the Master of Ceremonies. The ritual as well as the sung parts of the mass are offered during instruction. I have "threatened" to write on this topic before when certain things came up. Only now did I find the motivation actually to do it. So, here goes. As a musician, I can say that there is nothing more gratifying or rewarding than playing or singing at the Holy Sacrifice of the Mass. It truly is a privilege, and it's a chance for musicians to employ their art in the realm in which art originally developed from the beginning of history--the realm of religion. But, as we know, the Church militant is made up of imperfect people. It is a hospital for sinners, and not a mansion for saints. Anyone who has worked in the church knows this quite well and has likely felt its effects. It is well known that musicians of every variety have been mistreated by their pastors and parishioners. Musicians, to be sure, aren't the only ones. One of my teachers used to say, "Remember, the only one whose job is worse than yours is the janitor's, because everybody thinks they can do his job." Many have sacrificed much to work in the service of the Church, only to be shoved out the door for trying to maintain tradition or even orthodoxy--not to mention plain old common sense. I myself have experienced this, and something was relayed to me by a friend recently which caused me to reflect on some things that have happened to me in the past. It really opened up a lot of old wounds, much as I tried not to let it. I once held a job as a church organist which I sacrificed a lot to take. I moved to a place where I knew no one at first and ultimately had few friends. (I actually was convinced for awhile that this was because of some problem I had; only later did I realize that this was because of circumstances.) I barely made enough money. I was given no health insurance (in spite of the fact that the importance of this was preached from the pulpit). I lived in a bad neighborhood. And I was lonely. This was not a healthy situation. I poured my heart into the job, only to be put through a ton of bureaucracy after my first year, as they were trying to resist my program. The pastor stood by and watched this episode, keeping his involvement to a bare minimum. Foolishly, I kept the job for a few more years, until things deteriorated completely. In the lead up to this deterioration I had all manner of insults hurled at me by one of the parish leaders who should have known better--and who happened to have thought quite highly of my work (or at least said so) for a great portion of my tenure. Such a turnabout can be quite traumatic for the one on the receiving end of it. These kinds of episodes lead many organists to wonder whether it's worth it to work for the Church. After all the organist gives up--family holidays, concerts with friends, vacations (since the pay is often not good), even essential financial security--he ends up being mistreated, treated like a leper. So, is it worth it? In short, yes. In other words, church employees do not work for a pastor, they work for Christ and His Church. 2. I have found that the only way to maintain my sanity is to offer up my difficulties and unite them to the Mystery of the Cross. That may sound lofty, but it's actually very dirty work. If the Lord was mistreated, how can we expect anything different for ourselves? This takes practice, and I must admit that I've only begun to practice. Who knows how long it will take for this attitude to be the "default position" of my thinking. As one who has a strong sense of justice at times, I imagine that this is might be very difficult for me. Of course, there's a difference between offering it up and asking for it. I think it's obvious that we musicians in particular owe it to ourselves and to the parishes we visit to make sure that our respective philosophies are compatible enough to work. Similarly, if one finds himself in an obviously impossible situation, he has every right to leave, perhaps even the duty. Now, a word specifically to those of you in the pews. If you like the work that your parish music director is doing, take the time to tell him. He needs to hear it. Believe me. And if you don't like what he's doing, go easy on him. There's a lot that goes on that isn't apparent from the nave, and sometimes what the musician is forced to do makes him even more miserable than it makes others. Finally, whether you like your parish musician or you don't, pray for him. He needs that too. And let us all pray for the day when the worship of God, the Sacramentum Caritatis, will cease to be something that divides and instead truly unites us, as it is meant to do. I'd love to find some streaming video of the liturgical rites. Anyone? By the way, some of our American readership who have commented on the French tricolour with the emblazoned symbol of the Sacred Heart might be interested to see the same with the American stars and stripes in these images. I can't say as I always agree with the personal commentary of Fr. 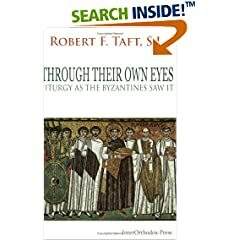 Robert Taft, particularly as regards Western liturgics, but he is most certainly known for some good scholarship, as such, it would be a worthwhile book to investigate. There were some who were concerned about the new incarnation of the Society of St. John which operates under a bishop now in Paraguay, who recently ordained two new priests in Rome. Francis Beckwith was president of the Evangelical Theological Society, an association of 4,300 Protestant theologians. Now is he among the most famous "reverts" to Catholicism. In this interview, he provides a bracing look at what drove him away in the first place. Looking back, and knowing what I know now, I believe that the Church’s weakness was presenting the renewal movements as something new and not part of the Church’s theological traditions. For someone like me, who was interested in both the spiritual and intellectual grounding of the Christian faith, I didn’t need the “folk Mass” with cute nuns and hip priests playing “Kumbaya” with guitars, tambourines and harmonicas. And it was all badly done. After all, we listened to the Byrds, Neil Young and Bob Dylan, and we knew the Church just couldn’t compete with them. But that’s what the Church offered to the young people of my day: lousy pop music and a gutted Mass. If they were trying to make Catholicism unattractive to young and inquisitive Catholics, they were succeeding. What I needed, and what many of us desired, were intelligent and winsome ambassadors for Christ who knew the intellectual basis for the Catholic faith, respected and understood the solemnity and theological truths behind the liturgy, and could explain the renewal movements in light of these. Segue to the other topic of the moment: the classical Roman Rite, which today makes the op-ed page of the New York Times. John Allen examines the implications of the Motu Proprio and speculates that its short-term significance is far less than people on the right (Yeah, rollback!) or the left (Booo, rollback!) are predicting. "Benedict, a quintessential realist, will probably be among the few who understand right away that his ruling is not terribly earth-shattering. Sources close to the pope I have spoken to say his modest ambition is that over time, the old Mass will exert a 'gravitational pull' on the new one, drawing it toward greater sobriety and reverence." 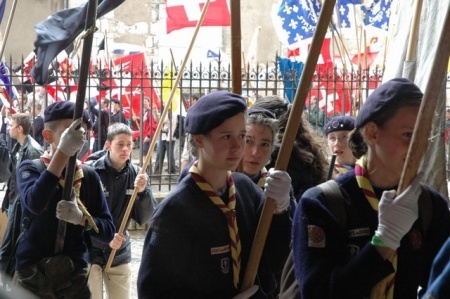 Most importantly, in my view, it will lead Catholics to once again embrace their heritage as their own, something that is connected to their present life and lives on in real time. Without a knowledge and embrace of our heritage, we are cut off and isolated, living in a strange alienation from our vast and glorious history. To me, the "gravitational pull" of which the unnamed source in the Vatican speaks is the most important implication of the Motu Proprio. It will pull together a tradition that has been effectively broken into two parts: pre- and post-1970. This is the most exciting thing about it, and why anyone would regard that as a threat is beyond me. It holds hold the prospect, over time, of achieving the continuity that Benedict and so many of us long for. Certainly a dignified and highly suitable setting, and one which looks to have some benefits for young families as well. One of the musicians at this parish as well as the Master of Ceremonies are both NLM visitors and supporters. "The programme was almost sold out within days of the initial announcements and we have a waiting list for another week sometime later this year..."
Encouraging and beautiful news, particularly when you consider there hasn't been a major media push about this. Fr. Pasley, a Knight of the Holy Sepulchre, is willing to take on individuals or groups, and they have some lodging facilities available. Father Pasley is also able to help give some basic music training for the mass. Mater Ecclesiae is of course one of the well-known full service 'Tridentine' rite parishes in the USA. Fr. Pasley is the pastor of this parish, and our own Michael Lawrence has involvement there. Fr. Castronova received permission to offer the 1962 Missale Romanum back when this was first offered and is a priest of 31 years. Father informs me that his parish has an intact high altar upon which to practice and there is a room available for a Catholic priest in his rectory for this purpose. If any others are competent to offer such training in their regions, please feel free to contact me and let me know your experience and training in the classical Roman liturgy, as well as what you'd be able to offer. 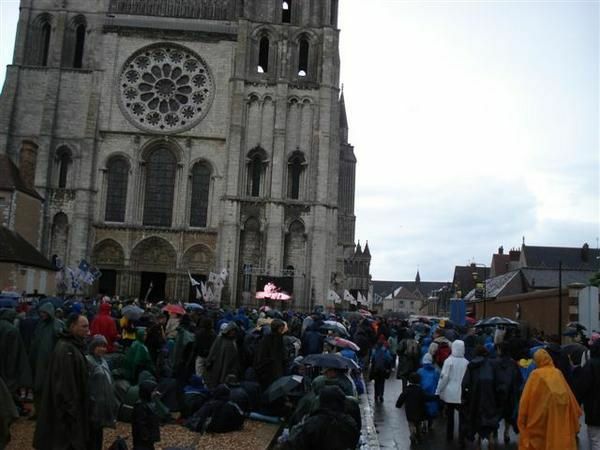 Preliminary reports from various sources are putting the Chartres pilgrimage at around 10,000 participants, just FYI. 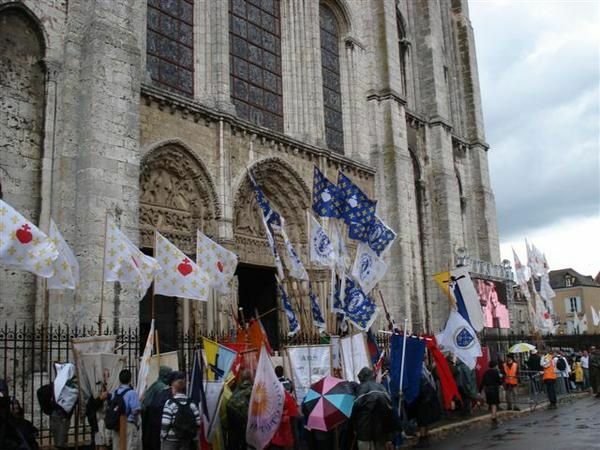 Roger, a reader of the NLM who was on the pilgrimage made this video of some Bavarian Chartres pilgrims. If you live somewhere near Kalamazoo, Michigan, please consider coming to a short music workshop I'll be conducting at St. Mary's Church (939 Charlotte). 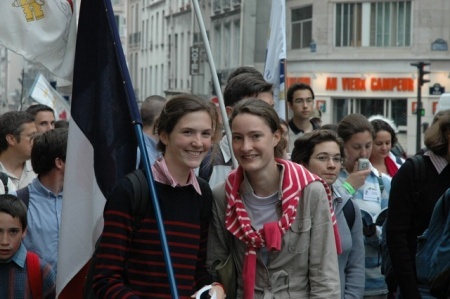 It takes place on June 9, 2007, beginning at 10:00am. We'll be singing an anticipatory Mass for Corpus Christi at 4:15pm. We'll be tackling a full Gregorian Mass setting and some propers, including the Sequence for the day, as well as some polyphonic pieces. Lunch is served and there is no charge for the workshop (which means I'll not be paid a dime!). For more information or registration, contact Fr. David Grondz here or register online here. At last! These are the pictures I've been waiting for. 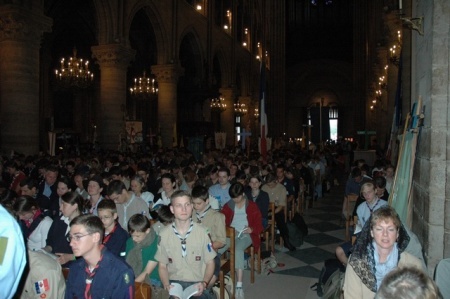 Thanks to one of our readers for noting these photos made available off the official Notre-Dame de Chrétienté page. Do look through all the pictures on their site if you want to see just how youthful is the classical Roman liturgical movement. But I will give you a sampling below. Here is a very significant part of the modern Church. Modern, but ancient; youthful and traditional. As it is well known, the Octave for Pentecost does not exist in the new calendar. This is unfortunate, as octaves point out the eternal orientation of the works of God. But let us not belabor the point too much. Instead, I'd like to pass along a wonderful suggestion from Fr. Thomas Kocik, which he gave in a thread from this past week. It is this: For the ferial days of this week, priests might consider saying the votive Mass of the Holy Spirit. This could have been done today (sorry....I meant to post this yesterday...), it can be done tomorrow, and it can be done Wednesday. From a quick glance at the liturgical calendar it might even be possible on Saturday, but I don't have the right materials in front of me to determine that. I have often experienced the desire to stay with a particular mystery of the faith for awhile, to converse with it. It's a grace, then, that Christmas has twelve days, and that Easter has many weeks. But for the same reason, it's also a shame that, in the new calendar, some feasts have been given short shrift. I'm thinking mainly of Ascension and Pentecost. Well, in any case, if use is made of the votive Mass of the Holy Spirit, we might be able to stay with Pentecost for a little while longer. 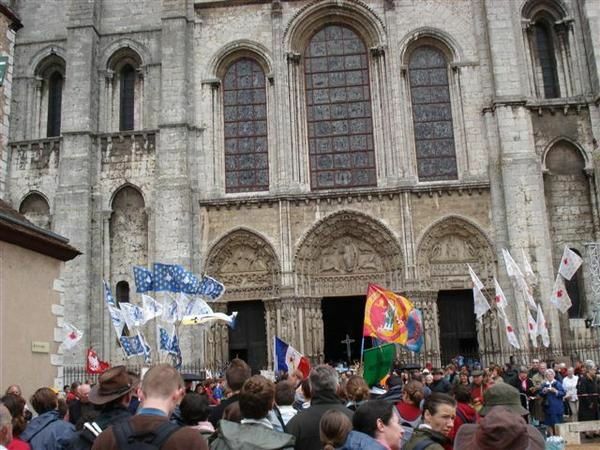 I have located some more photographs from the 2007 Chartres Pilgrimage from today, the 28th of May -- though I am looking forward to more, including any official photographs, particularly of the liturgies celebrated. For the meantime however, here are some photographs, courtesy of Pierre-Alain Besnard. As always, please forward me more as you find them. I've spoken with a number of people who report that attitudes toward our liturgical heritage are starting to loosen up, and dramatically. Five years ago, talk of the 1962 Missal within the mainstream of American Catholicism was seen as shocking and dangerous, perhaps subversive. Today, with the impending Motu Proprio, things are really changing and continue to do so. Now to a local specific that I find very encouraging. A parishioner requested that an FSSP priest come to town to say a public old rite Mass on Memorial Day. The request was granted without fuss. The pastor thought it would be fine and the Bishop said sure. Thank you! And so I write one hour after the conclusion of the first Tridentine Rite to be publicly celebrated in East Alabama in 40 years. The Church in which the Mass was celebrated was constructed in 1965, so the altar, which has not be changed at all, is intended to be used ad orientem. The visiting priest did very little at all to it to convert it to 1962 use. It is a church in the round, and architecturally dated but there was still something magnificent about seeing it used in precisely the way it was built to be used. It was a low Mass, but members of our schola still sang the communion chant, which today is "Factus Est Repente"
"Suddenly there came a sound from heaven, as of a mighty wind coming, whence they were sitting: and they were all filled with the Holy Ghost, and they began to speak the wonderful works of God." This is the same communio we sang yesterday in the new Roman Rite, but it took on special meaning in the context in which is appears today. The two communities--our local parish and the parish community of the FSSP in Atlanta--came together to celebrate not only the Mass but also their unity in faith. We spoke of the wonderful works of God with one voice. The Pope speaks of need more continuity from old to new, and it struck me that that music is one area that can provide it. To people who had never attended the classical rite, the first visit at a low Mass can be very confusing indeed. It looks and feels completely different. 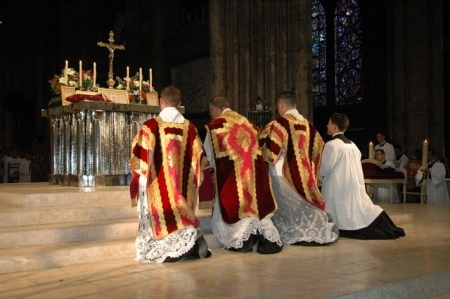 In fact, the two rites are more similar in structure than they first appear, and many of the most overt differences--orientation, language, sotto voce prayers, vestments--are in fact options in the new rite, so there is no necessary reason to persist in these great divides between old and new. As for music, it is essentially the same Gregorian musical language, so, in a way, music holds out the promise to unify modern Catholics with their history. And there is such a crying need for this today. Parishioner reaction was striking. I saw people there who I didn't think had any attachment to the old Mass, and they were touched by what took place. One person said that she broke out in tears during Mass for reasons should couldn't explain. An older lady told me that she had a whole lifetime of memories flash over her, and she had a look as if she had seen an apparition. 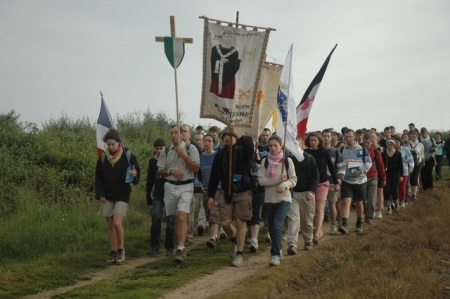 There can be no doubt that this experience was very good for the parish; indeed, it seems quite overblown that anyone should regard tradition as somehow a threat to Catholic life. On the contrary. What leads people to love the faith is good for all aspects of Church life. Does this mean that parishioners are going to start a sudden clamor to have the classical rite? No, I don't think so; nor was that the intent. But experiencing it does open the mind and heart to the broadest possible appreciation of our heritage of beauty and solemnity. So having a public liturgy like this certainly encourages everyone to be liberally minded toward making it a normal part of Catholic liturgical life again, and learning from the classical rite as a standard. It was a joyous and emotionally uplifting experience for everyone, and I was personally touched to see these two groups mingling like old friends. "On Sunday, May 27, he received audience Robert Spaemann, professor emeritus of the University of Munich, Germany." I'm not suggesting this is why he met with Professor Spaemann, but it will be interesting to hear in the coming days if Professor Spaemann discussed the motu proprio with the Holy Father and if he gained any insights. With all the talk of developing a core repertoire of music for Catholics (Heaven knows we need one; whether it can be legislated is a different matter), Gary Penkala draws our attention to a little-known fact: one was actually put in place 33 years ago. It is called Jubilate Deo. It was issued by Pope Paul VI as a gift to the Church and the world, and it included introductory matter: "those who are trying to improve the quality of congregational singing cannot refuse Gregorian chant the place which is due to it." Those who know chant tend to neglect this collection because it is too limited. But for the vast majority of Catholic musicians who know very little (or next to nothing; ok, really nothing) about chant, this little booklet is a great revelation. It would serve any parish well for years, in my view, in any case. I get the impression that Paul VI issued it as a kind of emergency measure, in tribute to the indisputable intention of the Second Vatican Council to reduce the role of vernacular hymnody and increase and democratize the use of Gregorian chant. (Anyone who believes that the council really intended to unleash what is called praise music is woefully ignorant of the important discussions and debates of the period). But the issuance of Jubilite was a little like trying to repair a broken dam ne pebble at a time. The Jubilate was widely ignored and swept aside by the crazed enthusiasms of the 70s. But perhaps Penkala is right that it is time! He provides some excellent links to free copies, including this interesting site that has images and music on MP3 files. The headlines are striking: "Americans believe in religion but know little about it." The United States is the most religious nation in the developed world, if religiosity is measured by belief in all things supernatural -- from God and the Virgin Birth to the humbler workings of angels and demons. Americans are also the most religiously ignorant people in the Western world. Fewer than half of us can identify Genesis as the first book of the Bible, and only one third know that Jesus delivered the Sermon on the Mount. The book on which this article is based might contain data on Catholics but the article doesn't report it. Most striking (to me) is that evangelicals are only slightly more knowledgeable than the general public. The article speculates on the cause, and talks extensively about how religious education was once woven into regular education, and how that has been lost in our times. The author recommends that religious literacy be reintegrated into high school curricula. I'm not sure that this constitutes a persuasive explanation or a viable solution. A more obvious culprit here is the dramatic change in the method of teaching in Churches that seems to date from sometime in the early 1970s. Most anyone raised who came through Sunday School or CCD (or CFF, or whatever it is called today) in the 1950s and 60s faced something approaching a rigorous program. There were Bible verses to memorize, doctrine to master, drills, and a catechism. There was an agenda, a text, and a job to do. Then something strange happened. People who went through CCD and Sunday School in the 1970s when through a decade of weekly share sessions. Catechisms were out. Memorization was out. Doctrine was thought to be too cold and alienating. What replaced it were sessions of experience sharing and general discussion along the lines of "what would Jesus do?" The whole 12 years of religious education amounted to little more than a recycling of the idea that we should be nice to others. There were no obligations placed on students beyond the requirement that people share their feelings and personal perspective. It doesn't take too much of that before you have lost a generation. Young people stop taking religion seriously, figuring that there is nothing of any real substance here. Once you learn a few platitudes about human relations, you have the whole thing. Then those people later find themselves in the position of being teachers, and they have little to teach people at all. It is more of the same. This problem has affected all denominations. Readers no doubt can contribute their own stories, and even today, as important as the need for liturgical reform is today, the whole issue of catechism remains incredibly daunting. Pastors are often reluctant to intervene into the system that seems to be wholly owned and managed by a handful of players working together with the director of religious education who in turn works in cooperation with the diocesan office of education, which is mostly populated by people who adhere to the pedagogical theories that brought about this mess to begin with. Also, it is notable that this widespread ignorance of essential religious facts comes about after a time when the liturgy was reformed with the specific intention of using every possible opportunity during Mass to provide forum for cognitive development. Communicating ideas to the people became the primary purpose of music, readings, homilies; even the style in which the celebrant presented the text of the Mass changed from a high liturgical style into more of a conversation/instructional style, to make sure that everyone fully understood the message. Latin was out, and non-cognitive means of conveying religious truth were depreciated. Well, did it work? Evidently not. What we had here was a confusion over the purposes of specific venues. The teaching that once took place in a classroom was transferred to Mass, and Sunday School or CCD displaced the activities that were once restricted to private devotional meetings. The high purpose of liturgy, public worship directed not toward the people's cognitive development but to the adoration of God, no longer had a natural home. 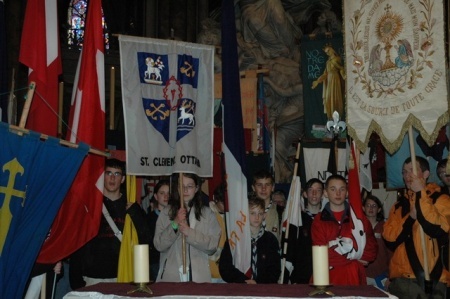 The beginnings of a reparation of this problem within Catholic circles, then, has a three part answer: 1) a firm conviction that true doctrine needs to be taught, 2) a belief that the classroom (and the home) is the right venue for teaching this doctrine, and 3) the liturgy is the activity in which the doctrine is applied and realized in the form of worship. 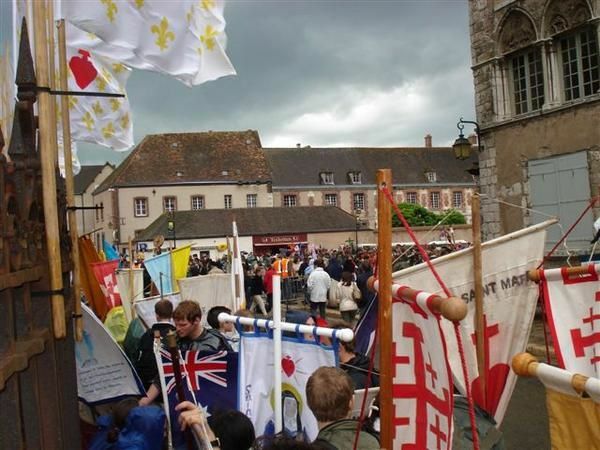 Thanks to another NLM reader for pointing out more pictures from the ongoing pèlerinage de Chartres (pilgrimage to Chartres). "Give us the grace, under His divine inspiration, to have a sense of the true and a taste for the good..."
Having a sense of the true, and a taste for the good. It's a pertinent meditation upon the Christian life in any age, but a particularly good reminder in an age of increasing relativism and indifferentism. Beautiful. 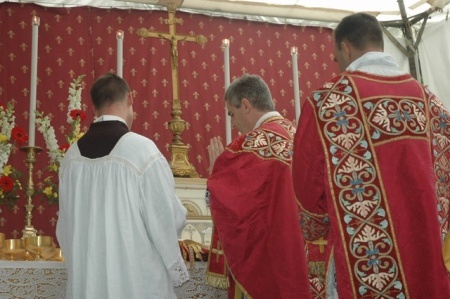 We're quite accustomed in the Latin rite to the liturgical colour of red being associated with the Feast of Pentecost. 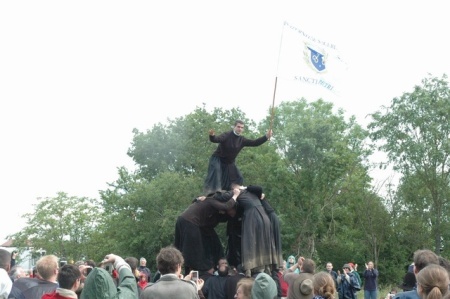 To that end, I thought I would share with you a variance upon this from the tradition of other rites. Namely, the Byzantine tradition where green is actually worn on the feast of Pentecost. This will likely strike people from the Latin rite as odd, since green is considered a non-festal colour in our own liturgical tradition. "The festive decorations of flowers and roses, it seems, was first introduced in Italy in the middle of the fourth century from where it spread to the East. 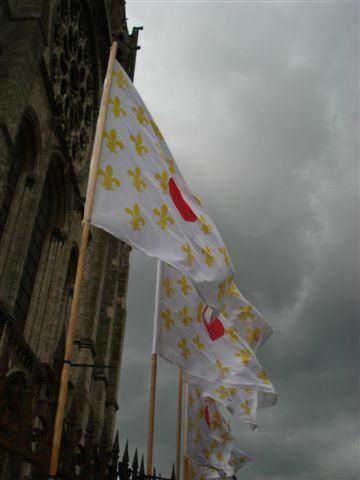 Because of the decorations, the Pentecost festivities were referred to as "Festa Rosalia" (Feast of Roses). When the Byzantines accepted the custom, they also accepted the name with it and simply transcribed it into the Greek—"Rousalia." Similarly, the Slavs in receiving Christianity accepted the custom and called the feast in their language - "Rusalya." St. John Chrysostom (d. 407) admonished the faithful of his time not to celebrate the feast superficially, only adorning their homes with garlands (flowers), but rather spiritually adorning their souls with virtues in order to be more able to receive abundant fruits of the Holy Spirit (II Homily on Pentecost). 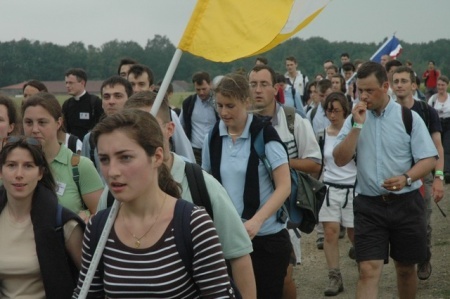 "Another popular name for Pentecost used by our people is "Zelenyi Svjata" (Green Holydays). This stems from the custom of adorning the churches and homes with green foliage (preferably linden branches) and grass in celebration of the feast. The green color of the foliage was accepted by our people as a symbol of divine life brought to us by the Holy Spirit. For this reason also, the clergy wear green vestments for the liturgical services on Pentecost and its post-festive period." Do take note of the curtained baldacchino being used, which has been so setup because of the apparent Westward orientation of the apse (as was found to be the case in a number ancient Roman basilicas being that they were constructed by the pagan Romans). Apparently the faithful where also positioned to the north and south sides of the church, rather than in the central nave facing toward the altar. You'll see in other pictures (by clicking the link at the top of the post) that the vestments worn by the two new priests are of the full conical variety.